It is with sadness that we inform you that Fr. Jim Doherty aged 92, on Friday 12 April 2019. Fr. Jim’s body will be received into St. Robert’s, Morpeth on Wednesday 1 May at 7.00pm and Mass will be celebrated. His Requiem Mass will be on Thursday 2 May at 12.00pm at St. Robert’s, Morpeth followed by burial at Fairmoor Cemetery. Please remember Fr. Jim in your prayers. A full death notice is now available. "As we begin the Easter season let us make it a time of renewal in our own lives. Let us be prepared to share our faith with others not so much by what we say but by what we do, by the kind of people we are." Bishop Robert has added the support of the North East Catholic community after the devastating fire at Notre Dame in Paris. The full video of his interview with ITV Tyne Tees News can be viewed here. 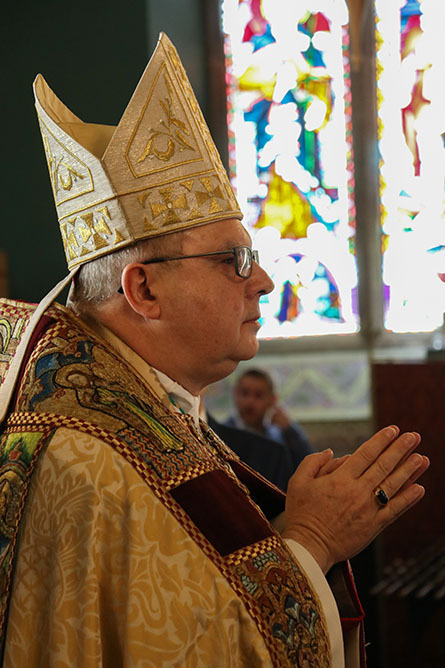 On Monday 25 March 2019, the Feast of the Annunciation, at the Cathedral Church of St. Mary's in Newcastle upon Tyne, Bishop Robert Byrne, CO, was installed as the fourteenth Bishop of Hexham and Newcastle. His Episcopal Installation was led by the Most Reverend Malcolm McMahon, Metropolitan Archbishop of Liverpool. The celebration began with the reading of a letter from Pope Francis and the ceremonial handing over of the Crozier by the retiring Bishop, Séamus Cunningham. You can read more about the Mass and view further images here. A press release to mark the occasion is also now available to read. On Tuesday 26 March a schools' celebration was held at St. Mary's Cathedral to welcome Bishop Robert to the Diocese. The congregation of over 600 people was made up of pupils, staff and school chaplains from our 156 Diocesan schools. 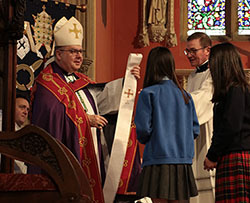 Bishop Robert was presented with a stole by two children whose ideas were used in the design. He was also presented with a book of welcome that included a greeting page from each school. The celebration liturgy included readings, prayers and songs on the theme 'Called to Serve'. St. John Vianney School, Hartlepool, and St. Anthony's School, Sunderland, provided choirs. After the celebration, Bishop Robert spent time greeting pupils and adults from each school individually. Please view the album of photographs from the day. On Saturday 18 May from 11.00am at St. Mary's Cathedral. Principal Celebrant is Bishop Robert. Booking essential, see poster for full details. Our theme this year is 'God’s Gifts of Love and Mercy' and we will look at how, for thousands of years, people have encountered our God who is full of tenderness and compassion, often in the face of human awkwardness and doubt! All resources are available to download or can be requested on a CD from the Department for Spirituality by email or calling 0191 243 3302. Read the new Diocesan Vision. Pastoral Letter - Lent 2019. Posters for events in the Diocese. The April edition of Northern Cross is out. Read Page 1. Minsteracres Retreat Centre - programme. There are no Diocesan vacancies at this time.